MasterClass is a way for Quarknet high school teachers to share their enthusiasm for cutting edge science research and expertise with their own students. 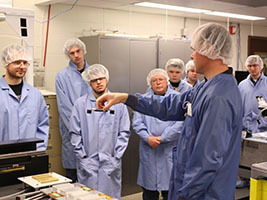 Purdue Physics and Astronomy Outreach hosts teacher led teams for a whole day of engaging activities where students will examine actual image data from CMS cosmic ray research at CERN first hand. Students engage with researchers and staff, tour available labs and meet others with similar interests from around the world! In the morning session, students will learn about the components of the CMS detector and how to pick out identifying characteristics of particles from event data. This is a great opportunity for students to learn about cutting edge research and engage with those doing it! After a leisurely lunch and guest talk, a lab tour just may be in order, choosing from our CMS detector fabrication clean room, laser research labs, Prime Lab particle accelerator, or PUR-1, Purdue's very own nuclear reactor research lab, the only operating nuclear reactor in the state of Indiana. The afternoon session culminates with teachers and their students participating in a live video conference with high school students and researchers from other QuarkNet centers from the U.S. or other countries. 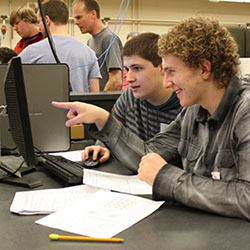 Quarknet MasterClass is held annually in February or March, and is open to high school teachers participating the QuarkNet program, just one of the perks for Quarknet Summer Institute at Purdue!